May 12, 2010 August 24, 2011 Elizabeth AshworthLeave a Comment on Should I drink this? I came across this at a local farm shop this afternoon. It is drawn from a well, known as King Henry’s Well where the Lancastrian king is said to have divined water during his time in hiding at Bolton Hall in Bolton-by-Bowland. 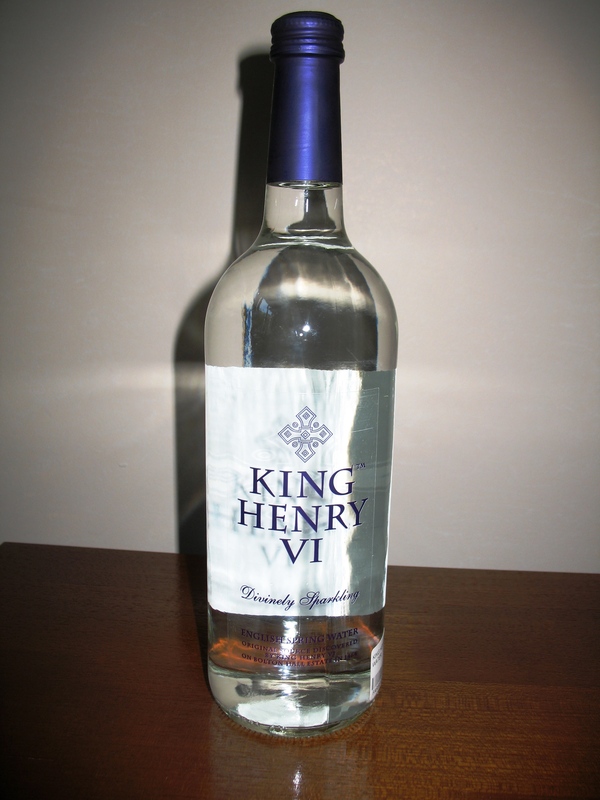 As Henry was known for his fits of madness I’m not entirely sure whether to drink it – although he was unable to rule because of his mental health problems for many years before his discovery of this water source. It’s thought that he suffered from some sort of catatonic schizophrenia, similar to the episodes of madness that affected his grandfather, Charles VI of France, who on occasions was convinced that he was made of glass and would shatter if he sat down. Henry VI was king from 1421 to 1461, and again for fewer than six months during 1470/71 when he was placed back on the throne by the Earl of Warwick (the king maker) following his rebellion against Edward IV. During the times Henry was unable to rule, the country was governed by Richard, Duke of York, as Protector of the Realm and in 1460 parliament agreed that after the death of Henry the crown would pass to the Duke of York and his heirs. But Henry’s queen, Margaret of Anjou was not prepared to allow her son, Edward, to be disinherited and with her supporter, the Earl of Somerset she opposed York and his sons. A few weeks later York was dead after the Battle of Wakefield and the Wars of the Roses had begun in earnest. After Lancastrian defeats at Towton and Hexham the Duke of York’s eldest son became King Edward IV and Henry fled and spent years hiding out in Lancashire. He lived at Bolton Hall with the Pudsay family for some time before being moved to Waddington Hall. He was discovered here in 1464 and despite escaping was taken prisoner as he crossed the River Ribble and was taken to London where he was kept in the Tower until his readeption in 1470. His reign did not last long. Warwick and the Lancastrians were beaten at the Battle of Tewkesbury. Henry’s son was killed and Henry himself died at the Tower of London very soon afterwards in circumstances that are unclear. Poor Henry. He was never much of a king and that wasn’t really his fault. He was a sick and damaged man and it’s a shame he couldn’t have lived out his life in obscurity in Lancashire, divining water and digging wells. Perhaps I will drink a toast to him after all.